For our part, we want to provide our US-based users a set of resources to help them make a smart, informed decision when it comes to who they will vote for. We also want to provide a toolkit so that they can get more information on where to vote, which issues are at stake and of course, after voting occurs, a way to show their pride and encourage others to go get out the vote. 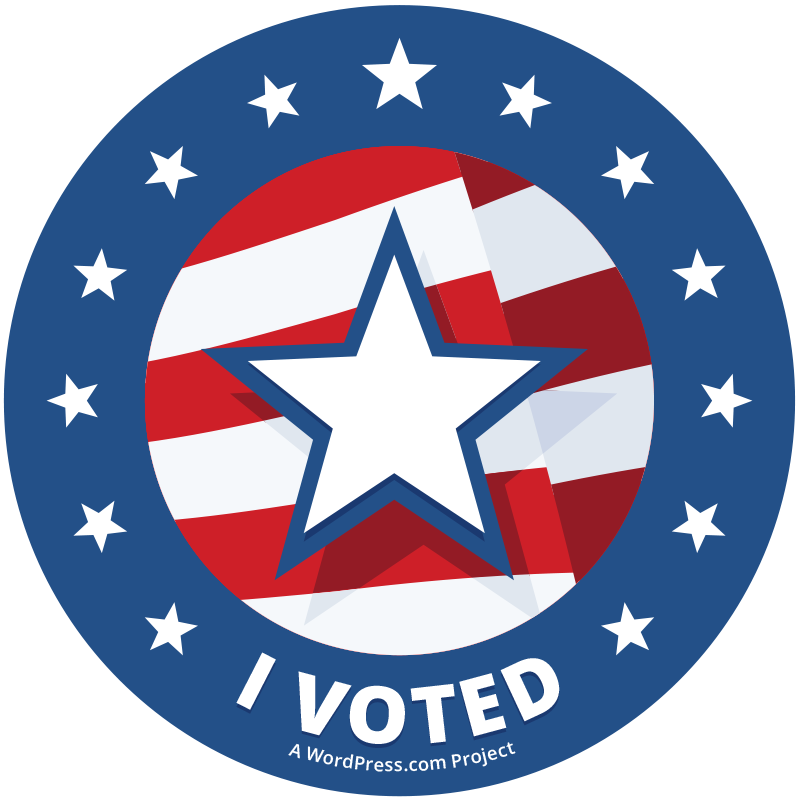 The only way a set of resources will be effective is if they make it into the right hands, so if you’re eligible to vote in the US Midterm Elections, take advantage of these tools and share them with your readers. It’s super easy using the [voterinfotool] shortcode. Just create a new post or page and drop the shortcode in (or click here to create a new draft with the embed prefilled). If you want to customize the experience a bit more you can drop in code directly from the Voter Information Tool with options like height, width, and colors and we’ll convert it to a proper embed code. Look under the Appearance menu for the “Widgets” option. Locate the “I Voted” widget and drag it to the sidebar of your choosing. Give the widget a title (optional) and hit the save button. Your badge will now be displayed for all your readers to see. Voting is our most fundamental responsibility as citizens — without it, our American democracy wouldn’t exist. WordPress.com is a platform that gives everyday people the ability to share their voice and we’re asking you to take advantage of this voice — by exercising your right to vote. We’re asking you for your help to spread the word, encourage participation and get out the vote on November 4th, 2014. If you have any questions, please let them in the comments and we’ll be sure you help wherever we can. Thanks! How do i remove the widget from my DASHBOARD completely??? there is no option to do so??? Leslie – there is a little triangle at the top of the widget – you can simply click that and it will collapse the box and hide it from view on your Dashboard. So… if nothing comes up when you enter your own registered US address… what does that mean? Stephen, state data is being released on a rolling basis as the folks from Pew get official sign-off from the state’s election authority and the data passes a rigorous QA process, then the information will make its way into the lookup app. It’s a bit of a slow process, but it’s the nature of the beast when you’re dealing with so many election jurisdictions. Please check back soon and the data for your locality should be there. Great, thanks for the response. I was concerned that possibly certain states (in particular those that have a bad track record in terms of encouraging citizens to participate in the democratic process) might be withholding this information. Re-blogging Peter. Really good stuff…thank you. Excellent. I am delighted to hear it. Would you do the same for the United Kingdom elections in May? Thanks, Clare! We’d love to promote this type of engagement anywhere we can in the world – after all – WordPress.com is a global brand (http://en.wordpress.com/stats/). Do you know if there are similar organizations who are building and promoting these types of tools? Maybe Google will have a similar project for the UK elections. I am trying but I do not know enough to follow your directions. I voted several weeks ago by mail — guess my age! Thanks for the response! When you log into your Dashboard, the appearance menu appears near the bottom of the left-hand side of the screen. Let me know if you’re still having trouble finding your way around the backend and I can email me some more resources. I love how this BIG THING appeared on my Admin dashboard! This is important and vital, and you made it super-simple to get more information and add the badge to the sidebar. Bravo! We need more proactive human efforts like this! Shake the tree of freedom until it bleeds! LOVE this! Thank you for making the process very easy; I’m delighted to be able to share this info with my readers! Forgive my ignorance, but what are we voting for? Is this internal to WordPress or federal? Thank you for making this so easy! This is really fantastic. I think it is important for a citizen to vote. When we do not go to the polls on voting day to caste our vote, we give room to what we do not like to prevail. It can also be interpreted to mean we are self-centered and think only of what interests us and not the common good. I think the value you place on your vote reflects the value you place on your voice and hence on yourself. Let’s go out and vote when we are expected to. Not an American, but I say GOODONYOUALL !!! Everyone should vote. NOT voting is being totally irresponsible. This is a fantastic idea. Thanks so much for making the tools so accessible. What a great idea. Not US but delighted for you all anyway. A great and superb idea. Just do not let the naysayers put any restriction on this like a “virtual poll tax” or some idiotic identity confirmation scheme to discourage encouraging vothing! Even though my newbie little blog has nothing to do voting it is going to receive this ‘treatment’ with a Be Sure and Vote post. Thanks so much! thanks for the reminder, just checked to find nearest voting location for next week. calendar reminder set! I voted by mail in early October. I, of course, therefore applaud you for this effort to encourage others to do their civic duty. I used the shortcode in a post, but the tool comes up as a blank box. Why is that? Does it look like a blank box when others pull up my post, too? (i.e. could someone take a look and tell me?) Thanks. I do love the idea. Thanks for offering this for our blogs! I voted by mail and am now on a quick visit to family. So happy to add this to my blog. This is an awesome idea! I love it! I know so many people that choose not to vote because they are uneducated on what is going on politically. What a great resource this is! Thanks so much for taking the time to help others make good decisions when it comes to voting! We always vote early….look at the candidates…their voting records and position on issues….then we mark those who appear to want to get the job done and keep our democracy strong. If your voting place has an early voting….avoid the lines and do it early. Thank God we still have a say-so. Pass this on to the young people you know who are voting age….for our vets who fought for freedom are dying off rapidly. I’ve noticed that you have not posted my comment here recently on the Election Boycott Advocates. Are we now into censorship or excluding contrary comments?? Or must I post all opposing comments elsewhere, Mr. Slutsky? Great reflection on “democracy”. It’s that time of year for those that don’t vote to complain about something. If that doesn’t put the pew in your Cheerios I don’t know what does. Nice article. Voting uninformed is no better than not voting at all. Maybe even worse. Why isn’t the voting information online. Seems strange I have to download an app to find out this one time information, that’s a cumbersome way to get data. Also ironically, the Pew Charitable Trust never surveys Native Americans and I can’t ever remember any of their polls including information on Native Americans even though they cover many other minorities. I’m regsitered to vote in the US and will definitely be voting, but I have reservations about for profit companies, regardless of their namby pamby “values”, engaging in the electoral process in this manner. Both Automattic and Google have their own political perspective and would only be doing this because they see at as futhering their ability to make profits. I have proudly displayed my ‘I VOTED’ emblem on my blog. I really appreciate this tool. Thank you! I added it to an older post about why I vote. Unfortunately, I am not old enough to vote yet.